Well what a change in the weather there was this week! 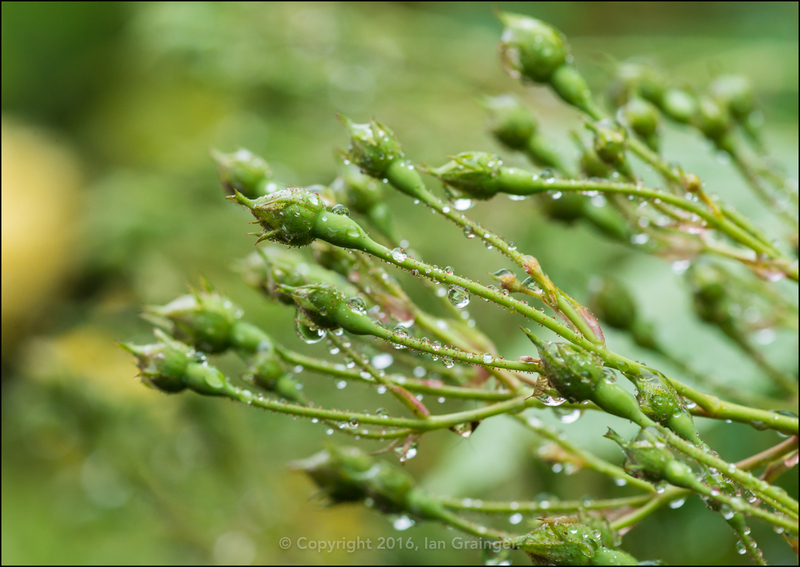 Last week I devoted my whole weekly article to the arrival of the insects, but this week it was so cold and wet there was hardly one to be found. 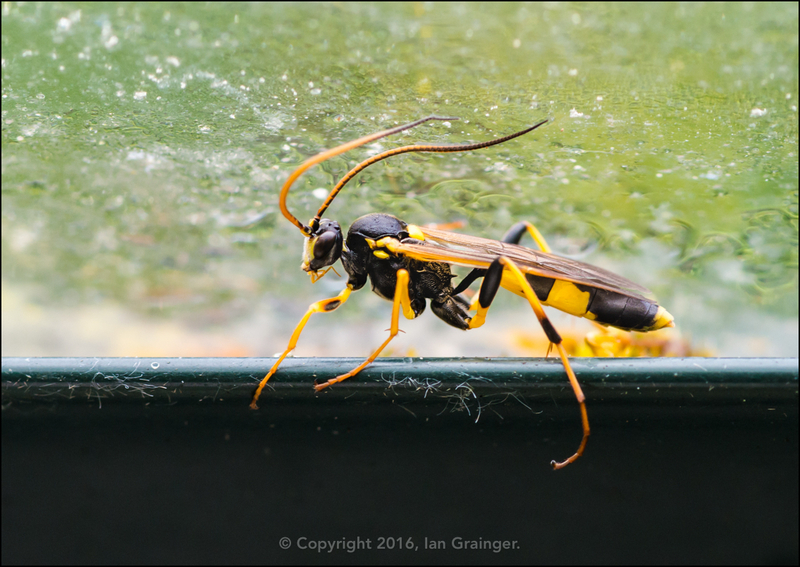 This fine fellow, an Ichneumon Wasp (possibly Ambyletes armatorius), had taken refuge in the greenhouse, to both keep warm and stay out of the rain I guess. 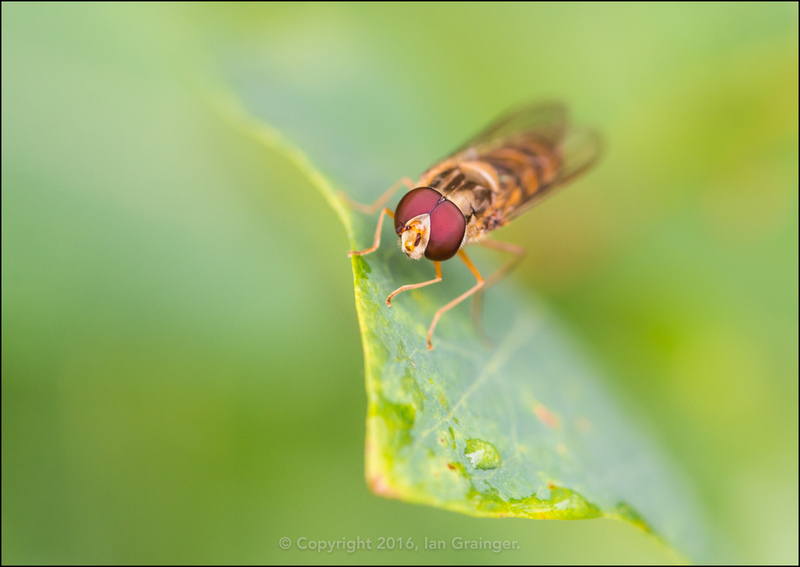 There were hundreds of Hoverflies buzzing around last week, but this week I could only find this loner, hanging out on a damp leaf. 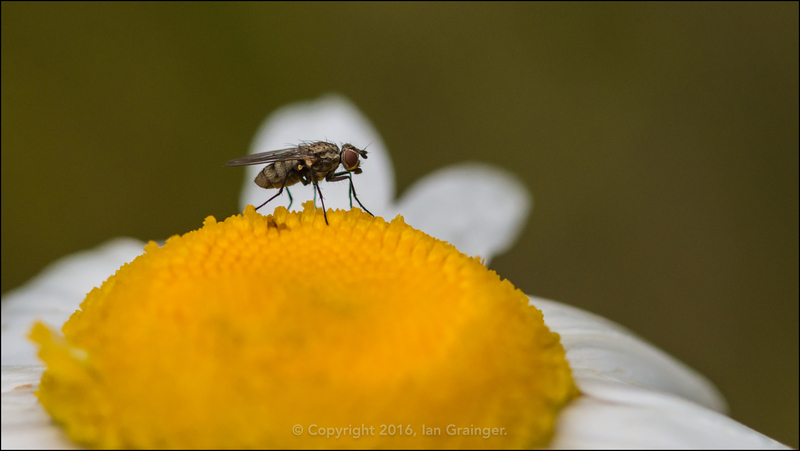 The only insects that were plentiful were the Flies (Diptera), and I liked how this tiny guy had positioned himself within the curling petal of an Oxeye Daisy (Leucanthemum vulgare). 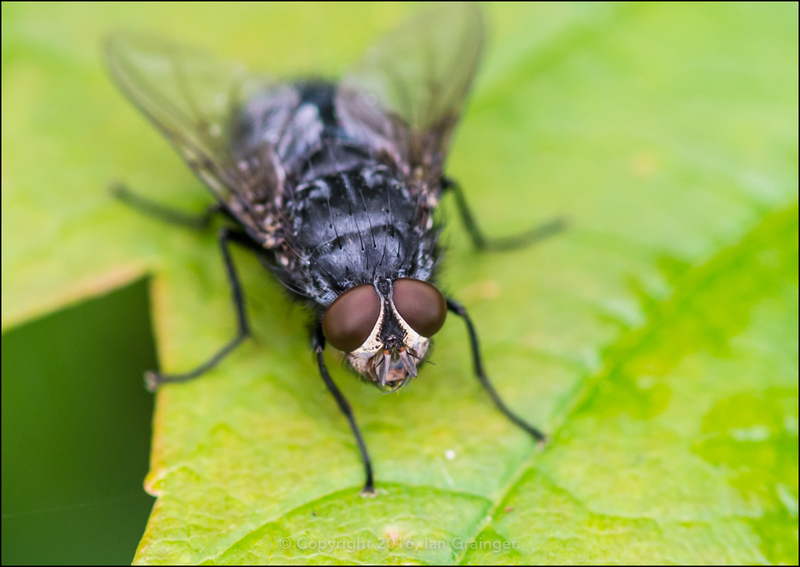 I'm not sure why I called this image Basking Fly, as there was no sunshine to be basking in. I was trying to get a shot of the head only, but didn't quite manage to get close enough before he buzzed off. 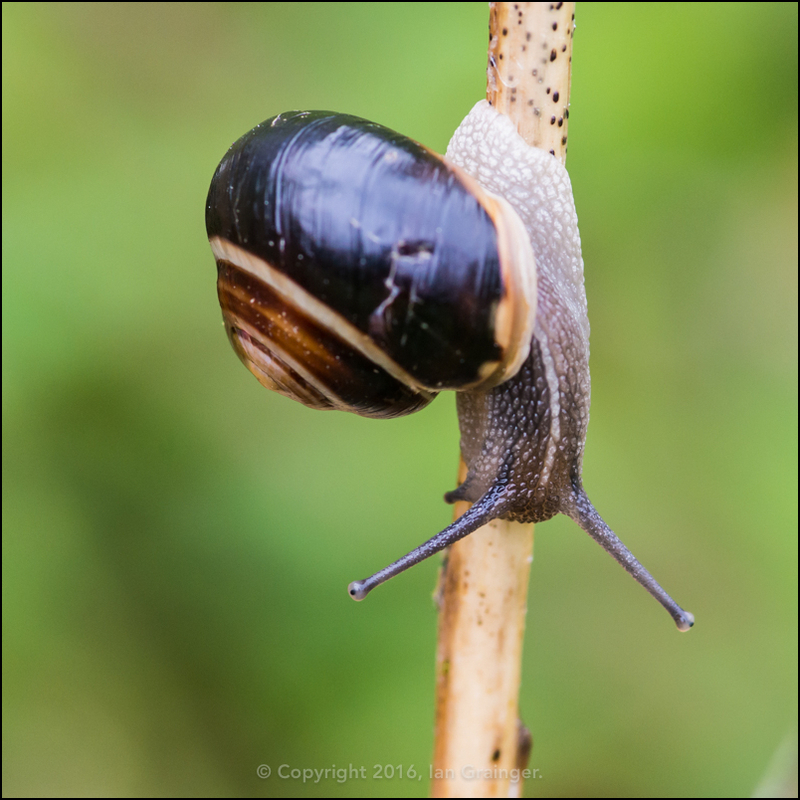 It really was weather for snails, of which I think this is a White Lipped Snail (Cepaea hortensis). There were literally hundreds of them making their way across the lawn, to go where, I have no idea! 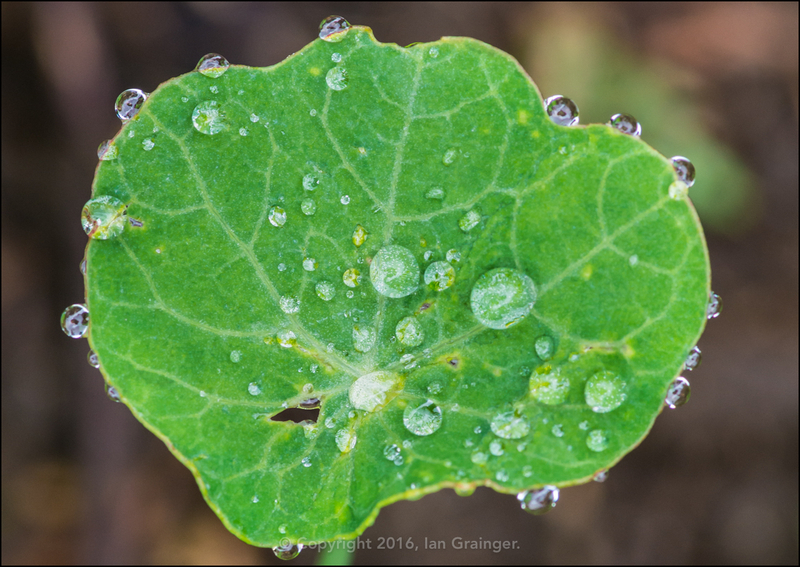 ...and the Nasturtium leaves looked quite resplendent with their watery adornment! 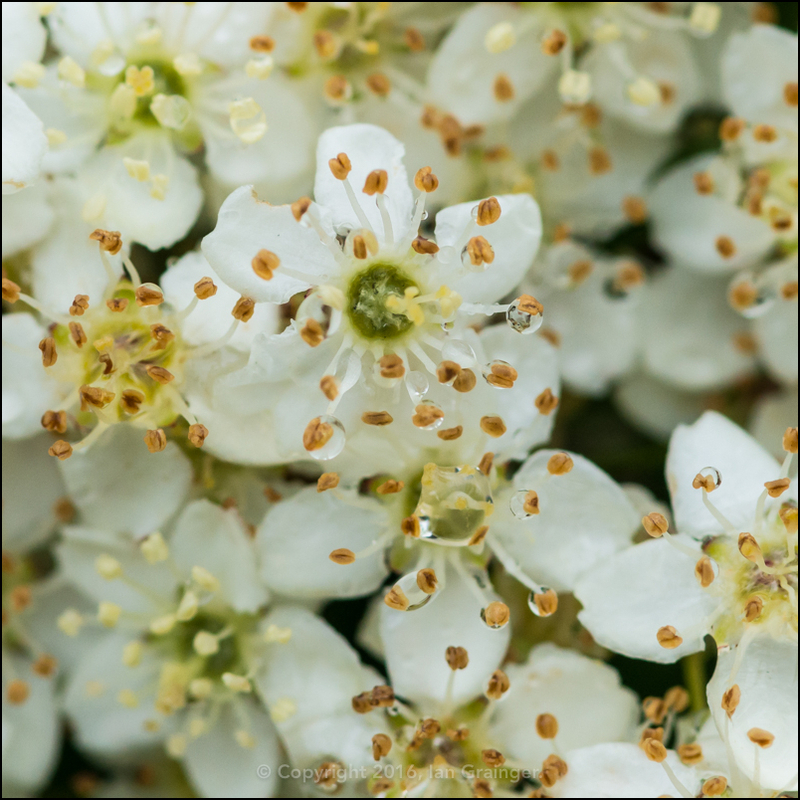 The Pyracantha bushes were putting on an early display of summer blossom, and even their flowers were covered in tiny raindrops. 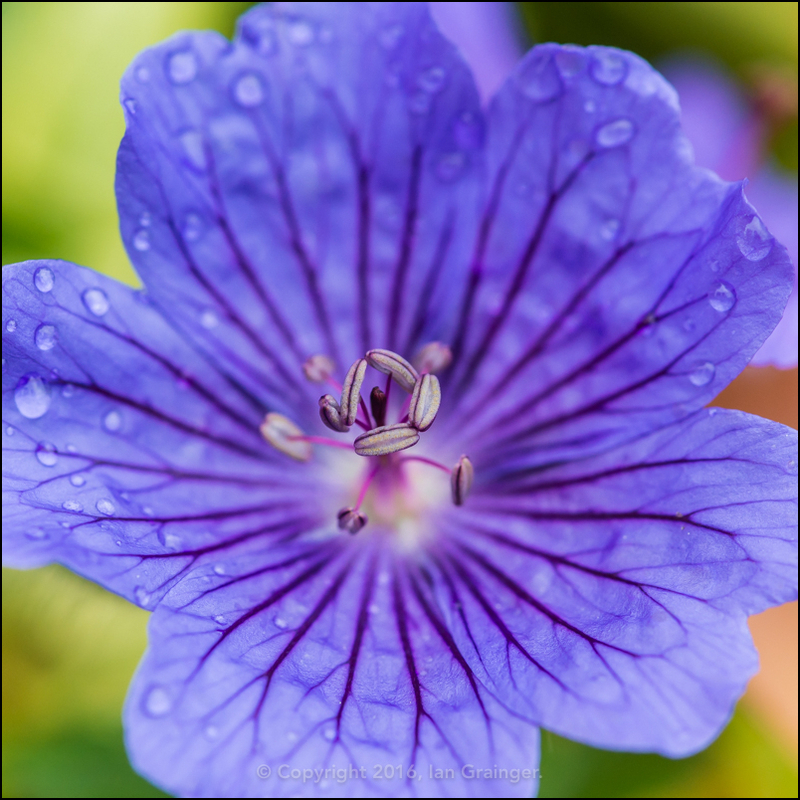 The Hardy Geraniums were putting on a nice display too, and this blue one looked particularly nice with its raindrop accompaniment. 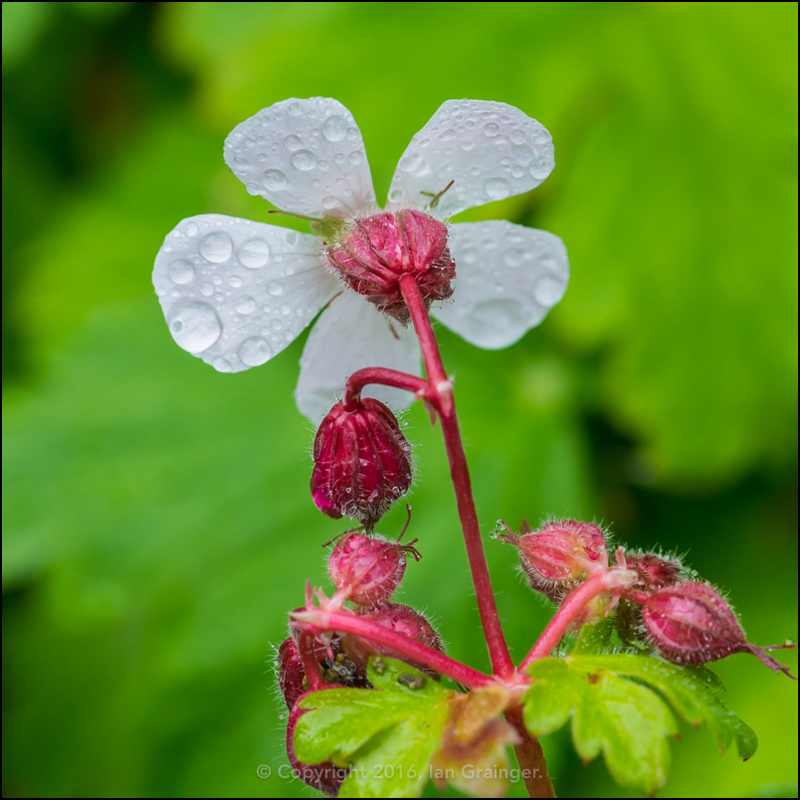 Another type of Hardy Geranium looked equally beautiful, even when viewed from behind. 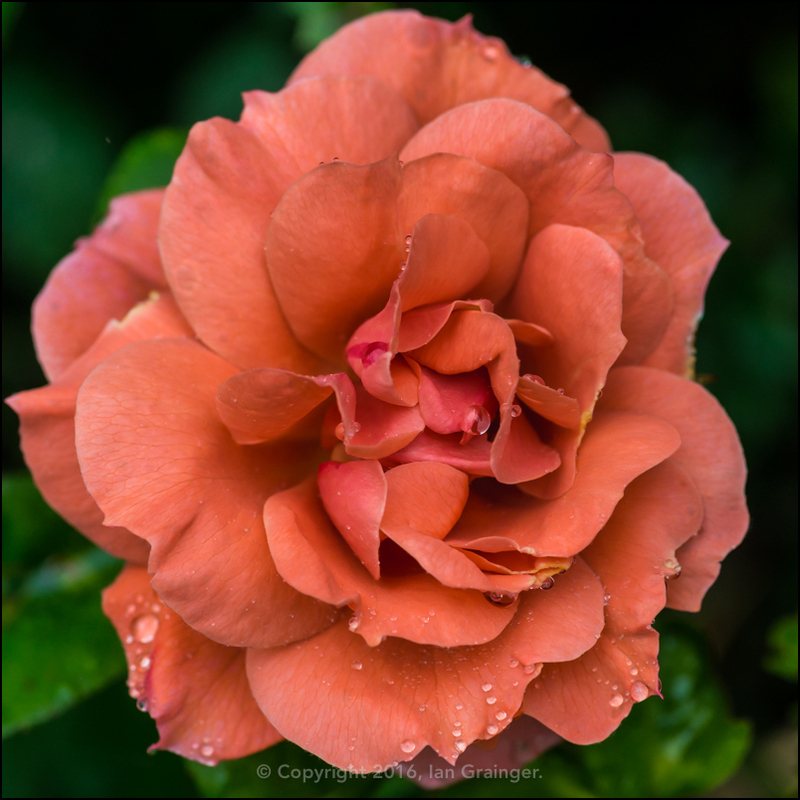 I couldn't post images of flora and raindrops without including a beautiful Rose (Rosa), this one is a variety called Queen Elizabeth. 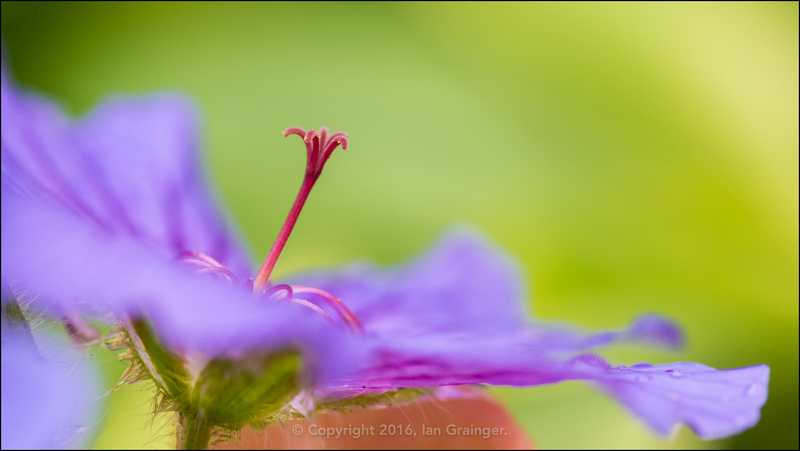 Here we have another shot of a Hardy Geranium, or rather the stamen of Hardy Geranium. 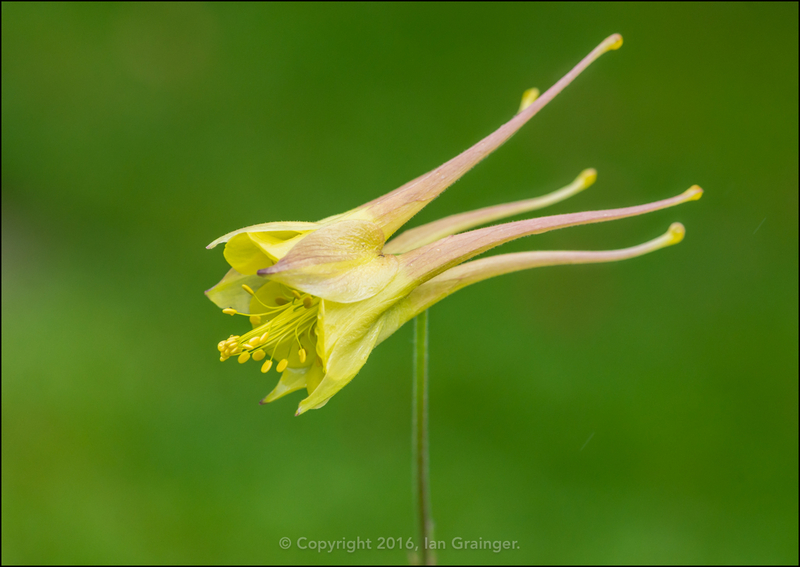 While I seemingly have huge problems getting Aquilegia plants to grow in my own garden, they grow like weeds in dad's. There were quite a few of these yellow ones dotted around the place. 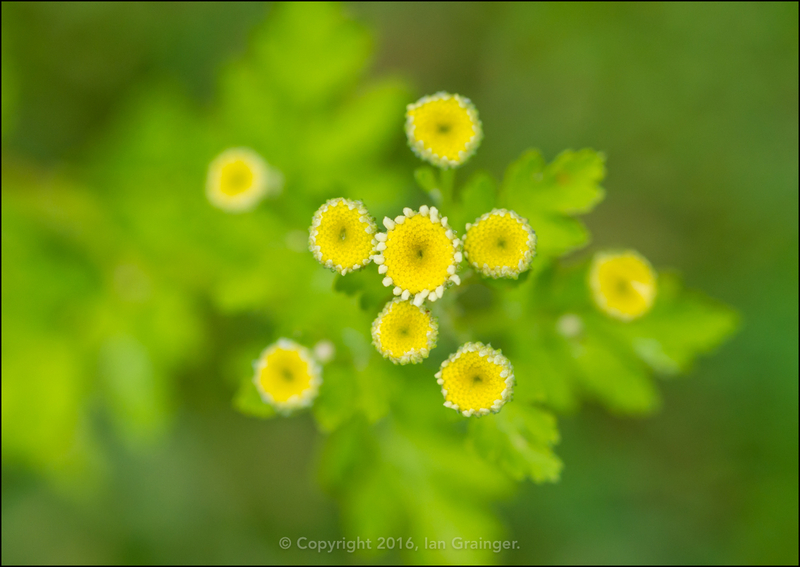 One of my favourite plants in dad's garden is the Feverfew (Tanacetum parthenium). I love its clusters of small daisy-like flowers, reaching skywards on tall stems. 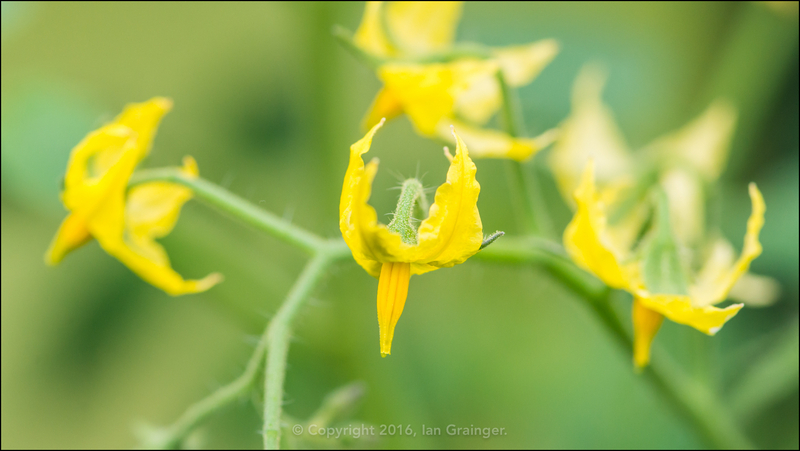 Back in the greenhouse, and while I wasn't chasing the Ichneumon Wasp, I had my eye on the Tomato blossom. There were actually a few tomatoes already forming, which I'll be showing you in the coming weeks. 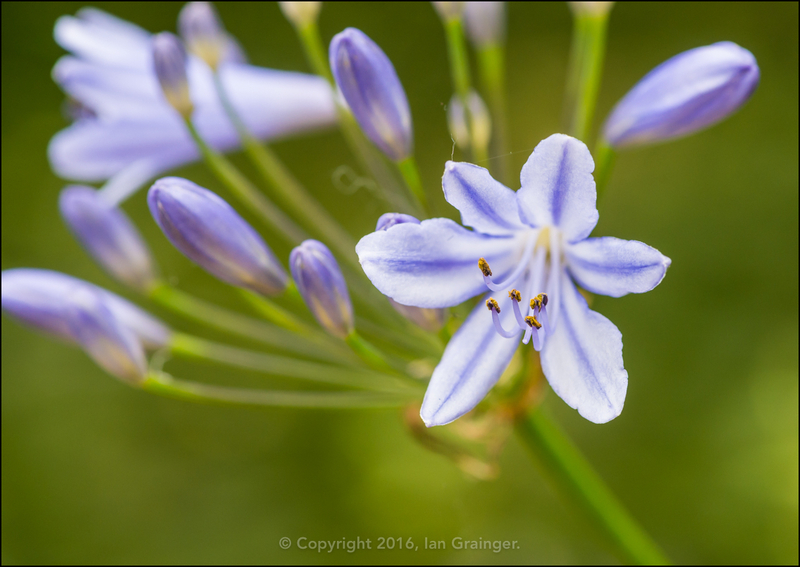 Back in my own garden my first Agapanthus had finally opened. It has lots and lots of flower spikes and looks like it will be flowering for a long time this year. 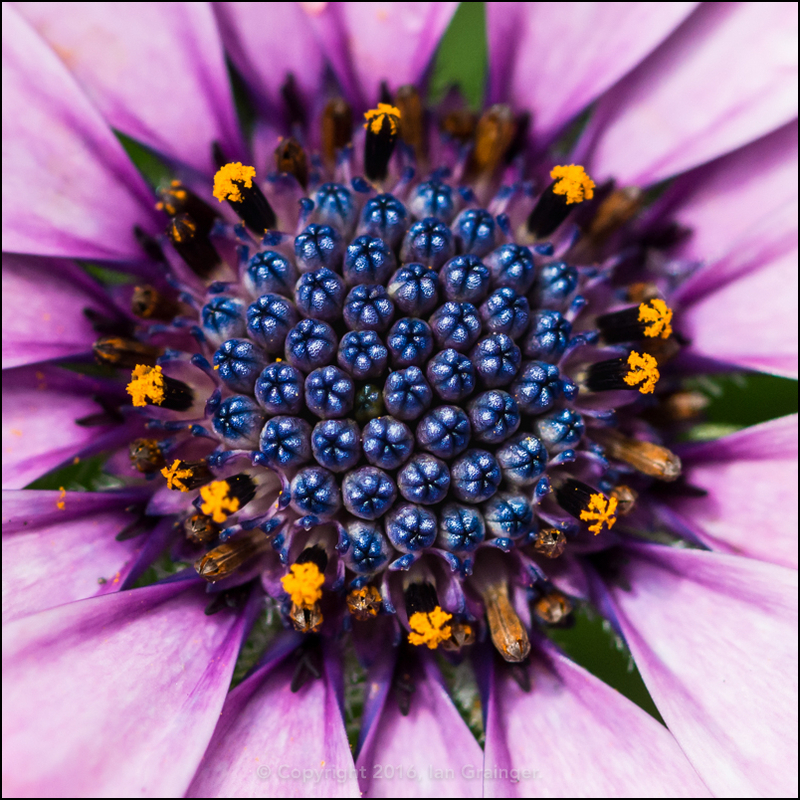 Given the weather in recent days, this appropriately named Rain Daisy (Osteospermum) was providing some much needed colour to my summer containers. I love the shade of blue of this particular specimen, and I'm still striving to capture the perfect shot of its colourful centre. 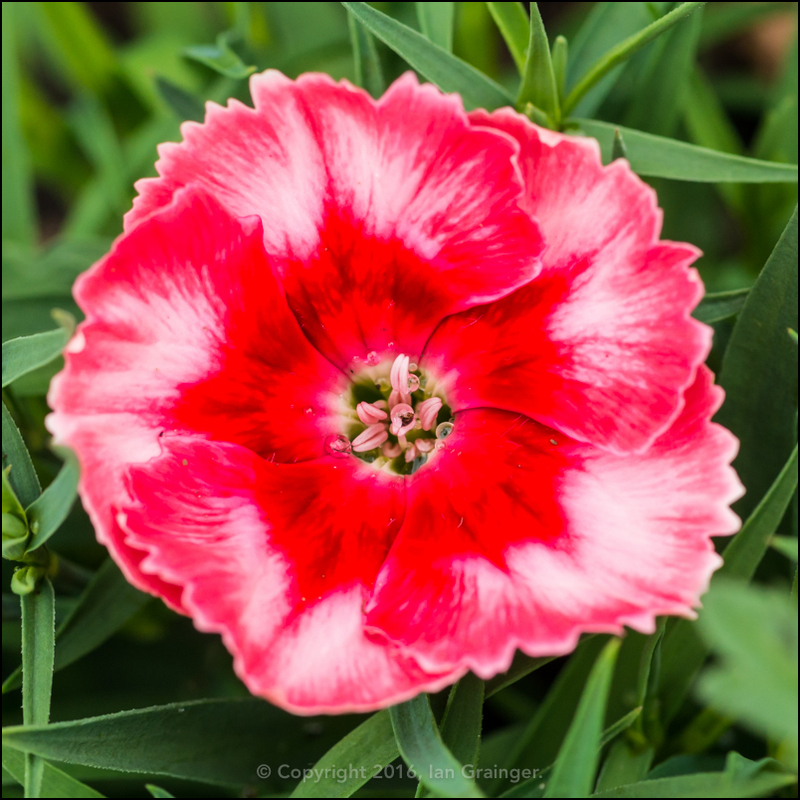 This pretty little thing is Dianthus Strawberry Parfait, and has only just begun flowering this week. 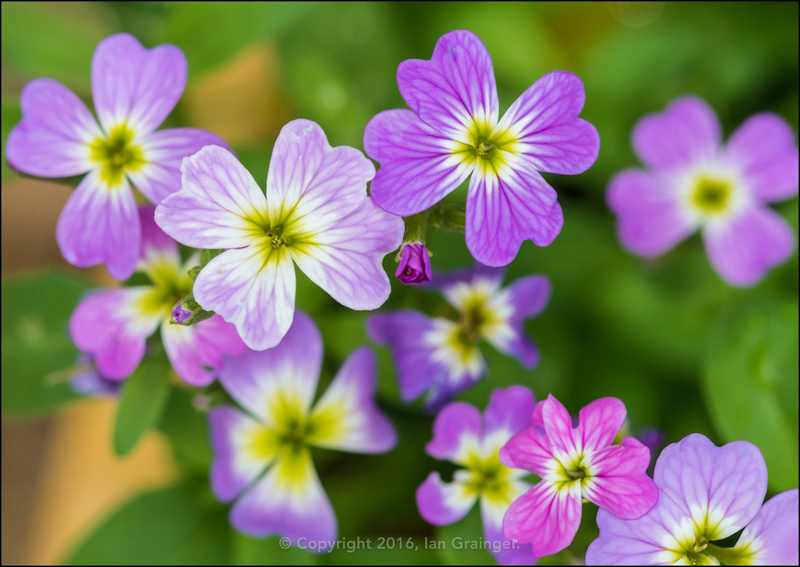 Obviously, the rain has done the world of good for some flowers, as another new flower to my garden is this Virginia Stock (Malcolmia maritima). I grew this from seed and it is putting on a fantastic display, with lots and lots of these lovely pink coloured blooms. 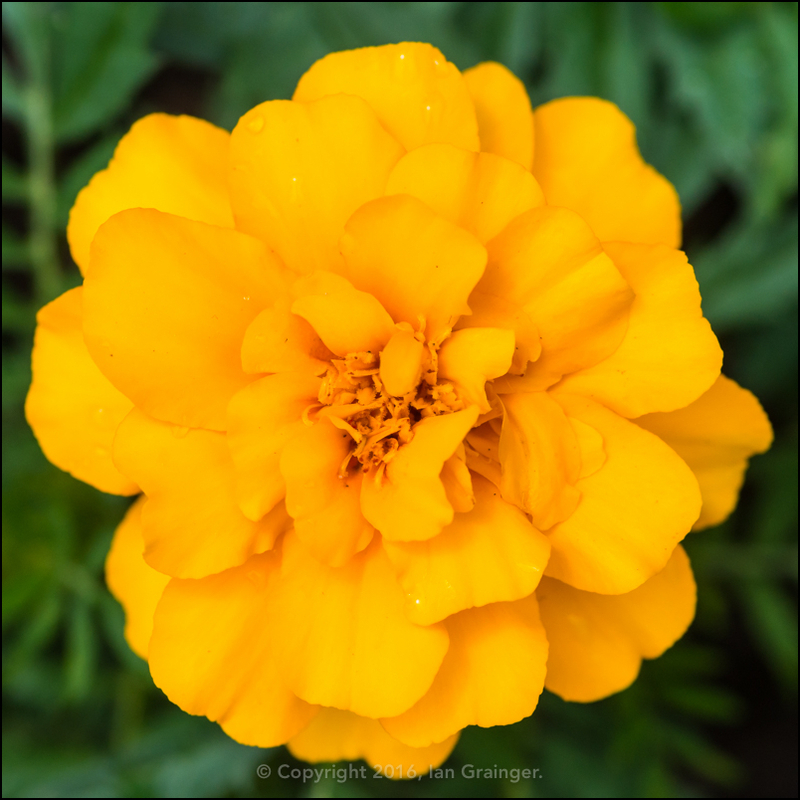 ...and this more mellow yellow one! 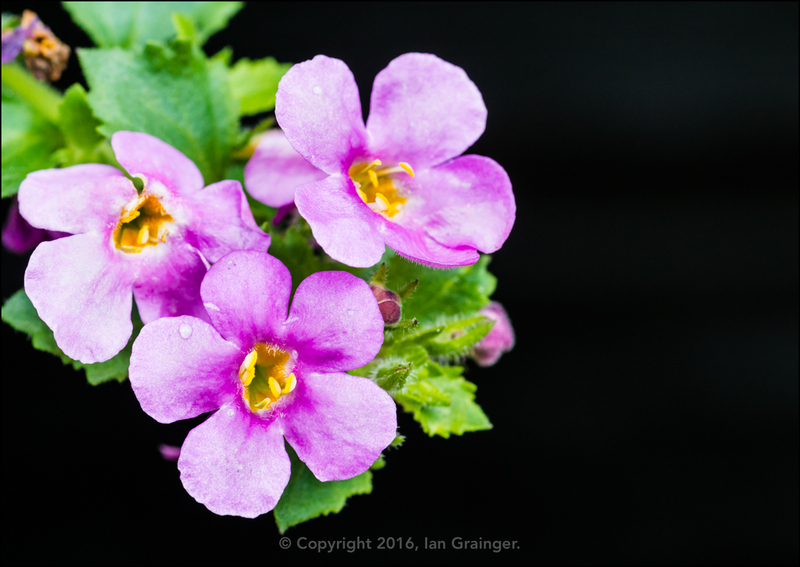 The pink Bacopa is doing well in my hanging baskets, and is looking even better since I painted my shed and fence black. 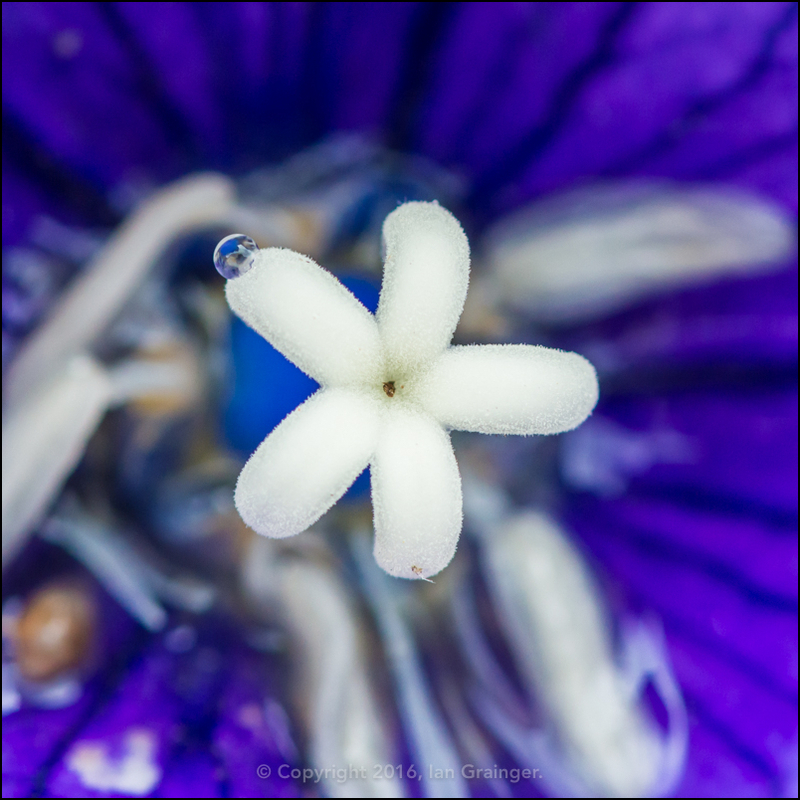 This Balloon Flower (Platycodon grandiflorus) is a new purchase, and has taken pride of place in one of my larger planters. 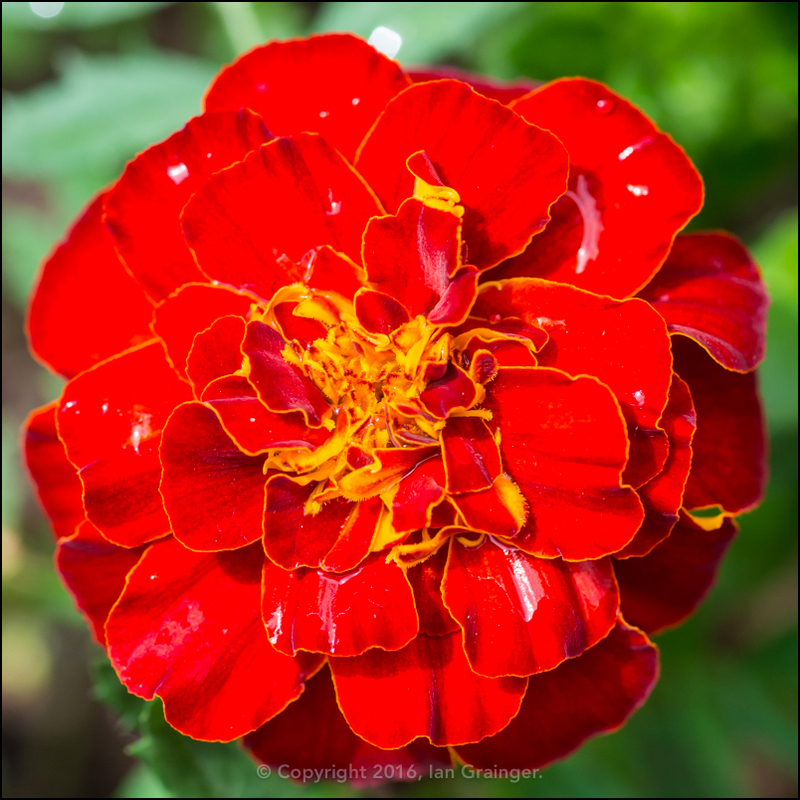 Returning to the rain theme, this flower had a single raindrop clinging onto its stamen. Finally, my photographic helper had absolutely no interest in following me around the garden this week. 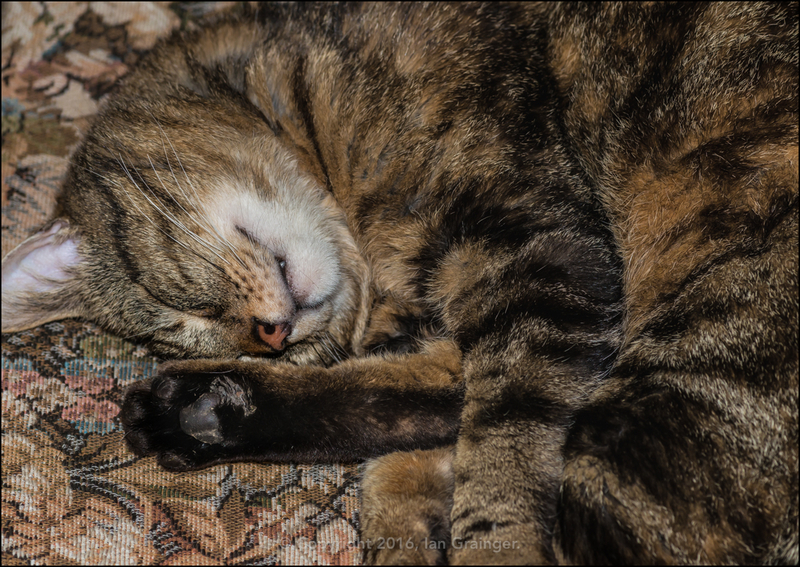 It was far too wet, so he did the sensible thing and had a snooze indoors while I got myself soaked!